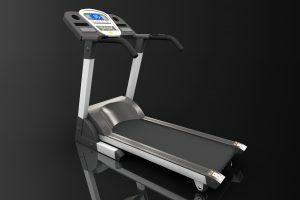 Best Treadmill Reviews UK 2019 - Which One is Right for You? 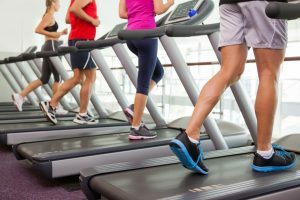 Best Treadmill Reviews UK 2019 – Which One is Right for You? Everyone knows that cardiovascular exercise can reduce their risk of heart attack, stroke, and long-term health complications. Still, many people do not get enough exercise daily to see a significant reduction in risk. For some, it comes down to a lack of time. For others, it’s a lack of self-confidence. Working out in a gym can be intimidating, and in the UK, volatile weather makes exercising outside difficult at best. Owning a treadmill makes exercising at home easy and convenient. In this article, we’ll aim to show you our picks for the best treadmill on the market. Thirty minutes of cardio exercise each day can boost your overall health and wellness, but travelling to the gym after a long day at work can be more trouble than it’s worth. Once you’re at the gym, you may be stuck watching a television programme that you find dull or listening to your neighbour grunting with effort. These annoyances can distract you from your workout. Using a treadmill at home allows you to focus on your exercise without the distractions of other people. Instead of worrying about the person behind you, you’ll be able to focus on your stride, your heart rate, and your breathing. There’s a certain degree of convenience in having one at your beck and call. If you have time for a short training session in the morning, you can get it in before you leave the house. There’s no need to battle traffic jams or wait on public transit just to get to the gym before work. Treadmills are relatively large pieces of equipment, but their sizes can vary based on the model, manufacturer, and features included. Some have a motor built into the front that allows you to change the incline level while others are little more than a moving belt, saving space in your home. The important thing is to look for a model has the features you want and the footprint you need. If space is at a premium, or you want to minimise the treadmill’s footprint, some models collapse and fold up so you can store them in a closet or the corner. It is important to note that these models are often not as powerful or durable and may not give you the exercise you’re looking for. Treadmills are available with a wide variety of features, depending on your price point. While the add-ons you choose are truly a matter of personal preference, knowing what you need before you start shopping will help narrow down your choices. With the advent of portable fitness trackers, heart rate monitors are becoming more common. Many models come with built-in sensors for these monitors so your information can be displayed in real time as you’re using the machine. This allows you to stay in your target cardio zone more easily. While this seems like standard technology, some rely on analogue counters. These old-school distance trackers are not as accurate as digital displays and lack many of the basic options the more modern treadmills include. Treadmills with digital readouts display distance, pace, duration, and even calories burned, giving you a better idea of the intensity of the workout. Great treadmills cushion the impact as you run through a combination of quality belt material and internal shock absorbers. This makes each step less jarring and puts less strain on your joints as you exercise. Good shock absorption is essential for runners and walkers but is particularly beneficial for those just starting out. Low-quality ones do little to benefit your joints as you run. Before settling on a treadmill to buy, you’ll want to consider the weight capacity of each treadmill. The motors on these are durable and designed to take a beating, but they have their limits. Some are more powerful and capable of handling a higher weight limit while others use a smaller motor and thus, cannot support the same amount of weight. Consider purchasing a treadmill that has an upper limit capacity well above your actual weight. This ensures that the motor is strong enough to hold up to the demands you’ll place on the system. If possible, head to a local sports shop and take a look at some of the models they have on hand. Try them out, examine the features each model includes, and ask questions of the staff. The more information you have, the better prepared you’ll be to make a final decision and the more models you try out, the more familiar you’ll be with how each feature affects the quality of the unit. If there are no sports shops near you, head to a fitness centre and ask the staff for information. Consider purchasing a pass to the facility for a week or so to give you time to try each machine. Many facilities provide different models with different add-ons, giving you an idea of what you like or dislike. Make use of online resources. There are some videos available online to help you better understand how treadmills work and what each feature contributes to the overall machine. Consider the primary exercise you’ll be doing and look for information that’s appropriate to that form of exercise. Watch this useful video for tips and tricks on picking the right model. The Branx Fitness Cardio Pro is a perfect introductory model that can grow with you as your fitness levels improve and your cardio health increases. It is foldable for easy storage and provides high-quality shock absorption in a small package. The belt is long enough for most people to run comfortably but is also ideal for those easing into exercise through brisk walking and light jogging. With a top pace of 20 km/h, it will accommodate both steady paces and interval training with ease. LED touchscreen displays accurate information. 18 levels of slope adjustment allow for fantastic cross-training. Free-weight rack on the side makes combining cardio and strength training easy. Built-in heart rate sensors on handrails provide accurate information throughout the workout. Low weight capacity of 130kg makes the model unsuitable for heavier users. Digital features may interfere with wireless routers when the machine is turned on. Screws must be checked frequently for tightness and safety. 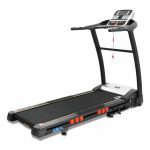 This folding model is perfect for users looking for a high-quality, near commercial grade treadmill for home use. The digital display uses high contrast colours to show distance, slope, calories burned, and interval information. The motor powers the belt up to 16 km/h and starts smoothly, reducing any jarring or unexpected pace increases. Though small, the unit has 16 points of cushion for superior shock absorption and includes a 5-year warranty on the motor and 2-year warranty on parts and labour. Should there be any issues with the frame itself, JLL will cover the cost of replacement or repair for the life of your treadmill. The belt is large enough to accommodate most average-height runners and walkers. It has wheels built into the frame for ease of movement and storage. Emergency stop attachment at the base of display area clips onto clothing for safe operation. Provides 20 levels of ramp adjustment for realistic running feel. Connects to MP3 players and USB devices with built-in speakers. It cannot be stored vertically, though it will fold flat for storage. Maximum weight capacity is 120 kg. Older MP3 units may not be able to connect with the interface. This lightweight model combines decent power and a small footprint to create a fantastic introductory treadmill. The unit comes with a built-in heart rate monitor on the handrails to keep you on track during your workout. The motor accelerates up to 16 km/h and has 12 slope levels to change up the routine. The deck provides adequate cushion and shock absorption for most users and it folds up for easy storage. The digital display is backlit for easy reading and speed controls can be accessed either on the main console or the handrails. Small footprint once folded, giving you control over your floor space. Emergency shut-off switch attaches to your clothing. Two storage compartments in dashboard keep water and accessories within easy reach. The hydraulic lift makes folding and unfolding it easy, reducing strain on back and knees. Pre-programmed routines cannot be customised. Built-in heart rate monitor does not provide a continuous readout. 110 kg maximum capacity, making it best for smaller or leaner athletes. The Elite Runner Pro is designed specifically for runners with superior cushion and shock absorption in the belt and running deck. 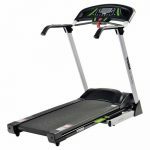 The longer running platform makes this treadmill ideal for taller runners or those with larger strides. The unit comes with 19 pre-set programmes and has 22 incline levels. The touchscreen display allows for easy operation while running and provides heart rate data through built-in pulse detectors on hand rests. Built-in speakers connect to most MP3 players, letting you run without the inconvenience of headphones. Folds up for easy storage and has built-in wheels to make moving it less difficult. Branx provides a 2-year warranty on parts and labour in addition to their 5-year frame warranty. Maximum weight capacity is 160 kg so it can accommodate most athletes. The high powered motor has a smooth start system to reduce jolts and unexpected pace changes. When folded, it still takes up a good amount of space and may not fit into a small storage area or closet. There is no pause function, making it difficult to stop in the middle of training without losing your data. This steel frame model is designed to accommodate most endurance athletes through the demands of more rigorous workouts. It has a high-contrast digital display with water bottle cage, towel area, and built-in pulse sensors for heart rate data. This model also comes with 24 pre-programmed workouts for easy interval training and quick start buttons for easy workouts. The steel frame supports up to 160 kg, and the large running space provides room for most average length running strides. Built in speakers for exercising without headphones. Folds up for storage and includes built-in wheels to make moving it easier. Built in rest for a tablet, e-reader, or book. Adjustable controls close to hand rests for ease of use. It is heavy and may require two people to move to storage. Shock absorption may be too light for barefoot or minimalist runners. Magnetic shut off cable is tight-fitting and may leave imprints on clothing. The Olympic covers the bare basics of an entry-level treadmill. This has a top speed of 8 km/h and provides three pre-set workout programmes. Like most modern treadmills, it comes with an emergency stop cable that clips to your clothing for safe operation. Though simple, it does have an LCD panel that shows distance, time, pace, and calories burned. The belt itself is small, so it’s best for walkers or short runners. Small footprint and light overall weight makes folding and storing simple. All the basics are covered; digital readout, solid platform, and a decent motor. Maximum weight capacity of 100 kg. No adjustable ramp options and the platform is set at a slight slope rather than being flat like most models. No built-in heart rate monitor or ability to connect to an external monitor. Best used with floor pads and vibration reducing mats. The compact design of this product makes it a great choice for those with space constraints or storage concerns. The digital display provides an easy-to-read panel with distance, time, calories burned, incline, and progress. With 15 slope levels and a max momentum of 14 km/h, it provides adequate options for cross and interval training to athletes of all levels of fitness. This folds flat for easy storage and can be stored upright to maximise floor space when not in use. It is relatively lightweight and can be moved when folded by one person. Comes with built-in pulse sensors for accurate heart rate information. Quiet motor for minimal noise pollution. Includes 1-year warranty on all parts and labour. Maximum weight capacity of 110 kg. No water bottle cage or storage area. May vibrate when running fast. The JLL S400 combines superior cushioning and shock absorption for comfortable running at all levels of fitness. The cushioning along the belt reduces the overall noise as you run and walk while also improving the comfort of each stride. This product has 15 pre-set settings and a bright, high-contrast LCD. The digital motor has an emergency shut off the system as well as a computer-controlled interface for a smooth start and stop without unexpected jolts and changes. When folded, it locks into place so it can be easily moved and stored in different rooms in your house. Hydraulic arm makes folding and unfolding easy and reduces the risk of back and muscle strain. The intensity of the workout can be controlled by heart rate levels, ensuring you stay in the right cardio zone for the duration of your set. Bluetooth connectivity allows for the use of tablets, mobile devices and MP3 players. Has a maximum weight capacity of 120 kg. It has a total weight of over 60 kg, so moving it up and down stairs can be difficult and requires the assistance of another person at a minimum. Cup holders are not large enough to accommodate most water bottles. The Confidence GTR Power Pro provides the basic features suitable for most entry-level users. The digital display shows distance, speed, time, and calories burned while indicating incline level. The motor has a top pace of 12 km/h and three ramp levels, giving users some variety in their workout without overloading on add-ons and variables. The control panel provides three preset programmes as well as a pause function to stop your run without losing data. It can fold up for ease of transportation and storage. It is lightweight and can easily be moved from room to room. The belt provides adequate space for most runners and nearly all walkers. Water bottle holders are large enough to accommodate most sports bottles. The belt has minimal cushioning and shock absorption, so it may not be ideal for those with joint issues or old injuries. The digital display does not connect to any external devices such as heart rate monitors or MP3 players. The motor can be noisy, especially at higher speeds. Lack of cushion can lead to carpet and floor damage, so it’s best to use padded mats underneath. The Reebok ZR8 combines superior cushioning and shock absorption with a compact size to provide a good home-use treadmill capable of handling the demands of new athletes and seasoned runners. The high-contrast digital display shows distance, time, and slope as well as calories burned and heart rate. This treadmill comes pre-programmed with 24 settings and three customizable programmes to suit your health goals. The 15 incline levels make interval training simple while the max of 16 km/h is fast enough to accommodate all runners. Best of all, it folds for easy storage and transportation. Links built in speakers to mobile devices and MP3 players for comfortable running without the hassle of headphones. Has handlebar controls for quick adjustments throughout the workout. Soft drop hydraulic bar makes unfolding simple without damaging the flooring. Emergency shut off switch is sensitive and detaches with the slightest pull on the chord. May use more electricity than houses with older wiring are capable of handling. When folded, the platform does not store completely vertical, causing it to take up more space than other models. If you ask us, the JTX Sprint-7 is the best treadmill of the bunch from our treadmill reviews. The overall durability of the frame’s construction and the superior cushioning and shock absorption make it ideal for runners of all skill levels. While many home-use treadmills feature lightweight construction, their frames and add-ons are not always up to the task when users demand consistent daily performance. Commercial treadmills are designed to take a lot of abuse, and the JTX mimics those durability requirements in a slightly smaller package, perfect for home use. Home treadmills must be durable and should be strong enough to grow with the user. The last thing anyone should have to deal with is searching for a replacement because the one they purchased initially cannot stand up to their current exercise demands. The JTX Sprint-7 uses elements seen in commercial models to provide you with a high-quality workout in the comfort of your house. With 24 pre-programmed settings, routines will never get old and the difficulty can progress with your fitness level. Great article and informative reviews, keep it up!